Whether I'm teaching babies, kids or adults, my approach includes understanding each student's personality; building their confidence and making lessons fun. What's more, I incorporate aspects of safety into my lessons. In this way, I have seen babies and kids flourish into happy and safe swimmers. My stroke learning classes have helped older kids swim competitively at primary-school. I've also seen adults thrive when enabled to swim. A water adaptation programme for babies from 6 months as well as older children who are younger than 2½/3. Maximum of 4 kids per 30 minute class. For littlies who are comfortable learning without a parent in the pool. Maximum of 3 kids per 30 minute class. Private and adult lessons also offered. 30 minute class. Private and adult lessons also offered. 083 270 8879 OR click the button above to send me an email. I really like Lynn's approach to teaching which is confidence-building, fun and yet safety-conscious. She pushes the kids to try new things but also knows when not to push as she watches each kid closely. My 2 year old daughter's swimming has progressed so much in this supportive environment and swimming lessons are the highlight of her week. Lynn is fantastic with the kids. She gives each of them individual attention. 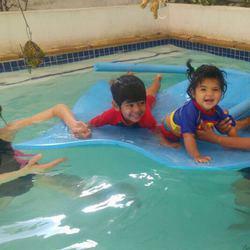 Builds their confidence and creates lots of games and songs to make swimming fun. Lynn is a fantastic swimming teacher. My daughter is 21 months and a little mermaid! Lynn keeps the pool very warm so we were able to swim throughout the winter (really critical if you want your child to learn quickly) and I loved that when we were away, Lynn let us make up those classes. Can't recommend her enough! I can fully concur with many of the other reviews, my first little boy had lost all of his confidence and was terrified of swimming, Lynn with her gentle nature and understanding of children has totally transformed him and now I battle to get him out the water. My second son has started with Lynn too and is exceeding expectations within a very short time. So pleased to have found Lynn, a true gem ! My little boy has been very scared of water, and never wanted to go into it but after 4 lessons with Lynn he jumps in and dives into her arms. His confidence in the water and around water has done a 360 and he just adores teacher Lynn. Lynn is an amazing teacher, she's warm and professional. My son, aged 3, is in his second term of lessons. He is confident, starting to swim by himself and truly adores his "Teacher Lynn". Lynn is extremely accommodating and has shown great flexibility with scheduling lessons, she communicates so well and responds timeously to texts/emails. Even in a group lesson, Lynn gives individual attention with reassurance and instruction personalized for each child. Love2Swim came highly recommended and now I can tell why. The after lesson treats are an added bonus. Learn2Swim came highly recommended and now I can tell why. I started taking my daughter to Lynn at age 2. I m so impressed with the way that Lynn has taught her to go underwater and blow bubbles, whilst kicking and teaching for the side. As a child who loves the water, she is learning all the safety tricks that will allow her to keep being fearless. This has been after 5.5 months! I moved my daughter to Lynn after she lost her confidence with another teacher. Lynn has been amazingly patient and encouraging with her during the process of getting her confidence back. Both Lynn and I were delighted last year when she suddenly took off in a lesson and now we are in the process of learning strokes (at age 4) We love Lynn and couldnt recommend her more. Our son who is about to turn 4 has gone from a previous swimming school not swimming at all to within two lessons with Lynn swimming happily and confidently. We started our daughter who is turning one from the start with Lynn and she is already confident in the water. 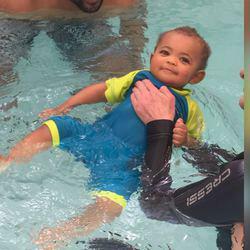 Lyn at Love2Swim had my 4 year old swimming independently within 2 months and my 1.5 year old simply loves swimming lessons and is confident and happy in the water. Lyn has a great way with the kids and they respond to her beautifully. I would recommend her to anyone looking for lessons! I started taking my children to Lynn for swimming lessons 3 months ago, and she won their confidence right from the first lesson, and they have all made huge progress on all fronts. I have been impressed at the personalised mix of reassurance and encouragement that Lynn gives each child. She has an ability to give them courage to try new things and to ‘jump in at the deep end’, to persevere until they get strokes right, while at the same time making sure that they really are water safe, and have fun in the process. They really do love going to their lessons, they love the warm water and they look forward to jumping onto the ‘magic carpet’, learning to dive and do handstands in the water! She is also very patient with us parents :), and I look forward to their lessons too. My daughter was really not doing well at swimming when I decided to move her to Lynn.. it was the best move I made! Lynn has a lovely way with kids and soon my daughter was loving swimming lessons and gaining confidence in the pool. To my absolute amazement Lynn got my daughter not just swimming but swimming really well within three months of lessons! I cannot recommend Lynn highly enough! Our 2 year old son started swimming lessons with Lynn in autumn. Within a month he has grown hugely in confidence and is well on the way to being water safe by next summer! Great job Lynn! I highly recommend Lynn's swimming lessons. Both my 4 year old and 2 year old daughters have made great strides since starting with Lynn 7 months ago. My 4 year old now swims happily and confidently, and my 2 year old is almost swimming unaided (initially she struggled with her ears and Lynn also got her past this hurdle and the water sensation). Lynn creates a fun environment for the girls to learn and incorporates songs for every new swimming technique. Lynn also has small classes with the maximum ever having been 3 children per lesson. My girls adore her.